1. GIANTS over the Broncos- At the outset, this game has some historical notoriety: It’s the first time in NFL history that two quarterbacks who threw for 400+ yards in the previous week’s games are facing each other in the very next game. That being said, we should be in for a fairly high scoring affair. We’re giving the edge to the ‘dogs in this one because there are too many intangibles going in their favor. Eli has never beaten his brother and this will be their third and probably final meeting unless they should miraculously meet in the Super Bowl. The prospect of beginning the season at 0-2 provides more incentive for Eli and motivation for the G-Men to ‘put it all out on the field’ this Sunday. Plus it’s the Giants home opener! 2. EAGLES over the Chargers- The Chargers lost in a heartbreaker to the Texans this past Monday night and with the short week and long trip East to Philadelphia, this all might be too much for them to handle. There is also Chip Kelley’s relentless offensive attack for the Bolts to deal with. (Just ask the Redskins about it…) Clearly, they will need to stop or at best slow down LeSean McCoy who put up 184 rushing yards last week vs the ‘Skins and that will be no easy task. There will also be the possibility of a 2-0 start to the season for the Eagles which is so vital in the usually uber-competitive NFC East. 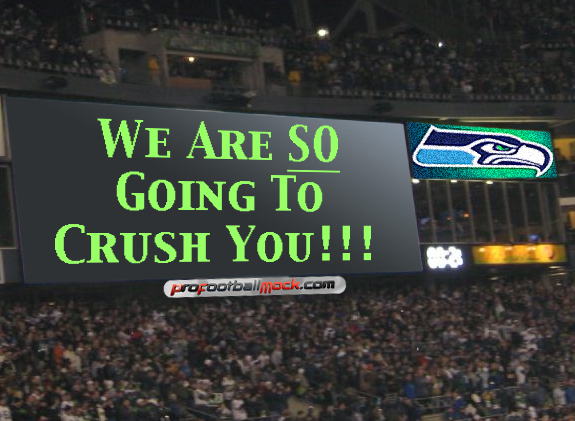 The Seattle Seahawks crowd will be the 12th man on the field in their matchup vs the 49ers this weekend. 4. BILLS over the Panthers- Both of these teams played against very good teams last week; the Patriots and Seahawks respectively, and both lost in very close and winnable contests. The edge here has to go to Buffalo however who seems to be playing well with rookie quarterback E. J. Manuel at the helm. The Panthers did hold Seahawks running back Marshawn Lynch to just 43 rushing yards on 17 carries so the Bills will need to open up some lanes for C.J. Spiller if they want to sustain drives and control the clock. The home crowd, which seemed to bother Tom Brady’s timing somewhat last week, will also be a factor in the game. The Pats, normally an extremely well-disciplined team, had many false starts in that one and almost lost the game outright. Edge here to the Bills. 5. BENGALS over the Steelers- We thought the line on this game would be a bit steeper than a touchdown as the Bengals just have far too many weapons at their disposal and should completely dominate in this contest. Ben Roethlisberger couldn’t even muster up a 200 passing yard day against the Titans last Sunday and will not have an easier time of it against the staunch and stingy defense of the Bengals. Pittsburgh also lacks any real offensive threats now and the their offensive line is not giving Roethlisberger ample time to get the ball off. 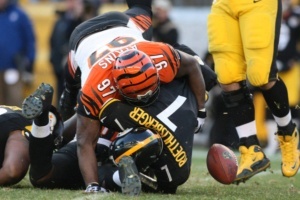 We’re expecting the Bengals to avenge all those many losses over the years to more well-balanced Steeler teams. I want to say that the last team with the ball wins this one and it’s entirely possible for it to come down to a field goal. Good luck & thanks for the RB!! 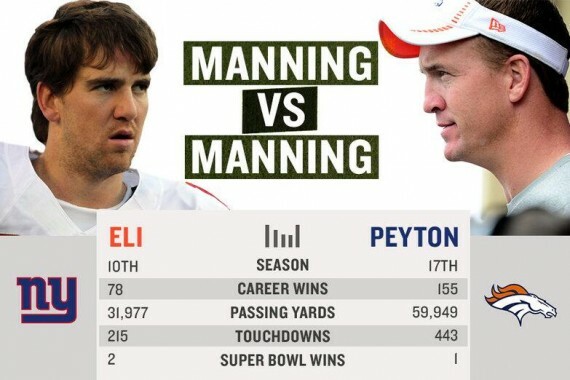 With all due respect to the Mannings, I’m most looking forward to the San Fran/Seattle tilt. And I’m not buying into Chip Kelly’s revolutionary offense just yet, although they should be able to take out the Chargers. And that Bengals/Steelers game means that the AFC North will finally win a game…right?